On view now through June 15, 2019 at the Museum of Design Atlanta (MODA) is the Passione Italiana: The Art of Espresso exhibition. 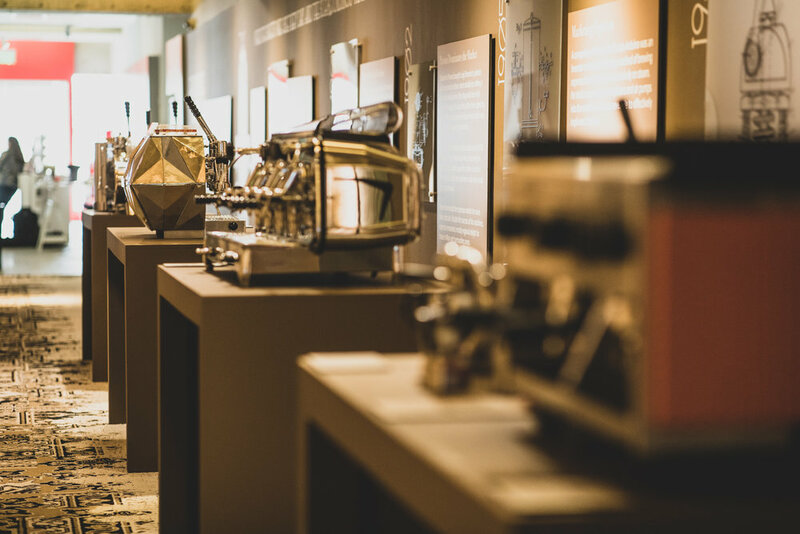 This spectacular exhibit showcases espresso makers used in Italy during the mid-twentieth century—alongside inventive coffee sets—and the designers/inventors associated with them. Overall, the exhibition showcases more than 50 pieces that date from the mid-20th century through present day. This exhibit should appeal to design fans and coffee enthusiasts alike. In addition to featuring the beautiful espresso machines on display (see images below), the exhibition also provides a perspective on how coffee and coffee shops have had social and historical impact around the world, including the role of cafés as incubators in social justice movements and how they have helped fuel literary movements, musical achievements, and even political revolutions. I had the chance to visit this exhibition last month, and photos from my visit are below. This blog post is organized by some of the major espresso machines and other items on display. At the bottom of this post, you can read a Q&A with Laura Flusche, Executive Director of MODA. Exterior view of the Passione Italiana exhibit at Museum of Design Atlanta. Interior sign of the Passione Italiana: The Art of Espresso display. Another view of the Passione Italiana exhibition at MODA. During my visit, I had the privilege of being guided around the exhibition by Laura Flusche, Executive Director of MODA. I captured the photos seen below after my tour. Taking in the scene at the Passione Italiana exhibition. On September 5, 1938, Achille Gaggia applied for a patent (patent number 365726 called “Lampo”) for the first modern steamless coffee machine. The disruptive mechanism described in the patent was for the use of hot water pressure instead of steam to prepare an espresso characterized by a soft layer of "crema naturale". For many in the espresso community, this first patent from Gaggia marks the beginning of the modern era of espresso. By 1947, the Gaggia company was founded with a formal incorporation happening a year later. The Classic was the first Gaggia espresso machine produced using the design from the latest patent. Because of his invention, Achille Gaggia earned an honorary title as the “Father of the Modern Espresso Machine.” In the decades following his groundbreaking patent, Gaggia has been at the forefront of the Italian espresso scene. It is safe to say that the coffee world would not be the same afterwards. For true history buffs, an amazing history of the Gaggia company may be found here. On view at MODA’s Passione Italiana exhibit is the 1952 Gaggia Milano espresso machine. Another view of the 1952 Gaggia Milano espresso machine on display at MODA’s Passione Italiana exhibition. In 1956, Gio Ponti, chief editor of the Italian design and architectural magazine Domus, announced an international design competition for an espresso machine. Domus selected the design by Bruno Munari and Enzo Mari. The design, featuring multi-colored modular plates or faces, was influenced by the architecture of Gio Ponti. At the time of the announcement of their victory, both Bruno Munari and Enzo Mari were still young and essentially unknown. Exposure in Domus catapulted Munari and Mari to instant fame. Bruno Munari and Enzo Mari nicknamed their espresso machine the "The Diamond" (“La Diamante” in Italian) for the multi-faceted shape of the elements which could be composed to obtain different combinations of colors and sizes. La Diamante was sold by the company La Pavoni under the name of Modello Concorso until the early 1960s. What’s interesting is that after a hiatus of about 50 years, La Pavoni released a contemporary interpretation of “The Diamond.” You can browse La Pavoni’s current collection of “The Diamond” here. With its pure steel body, the Faema E61 is the first espresso machine to use a volumetric pump to give the water the ideal 9-atmosphere pressure and keep the pressure constant during the whole extraction process, unlike the previously available lever espresso machines. Ernesto Valente invented what’s known as the E61 group; it is called that because it first appeared on the Faema E61 espresso machine. Curiously, the name E61 signifies the total solar eclipse that occurred in 1961, the year of its invention. E61 is now a common standard for commercial espresso machines worldwide. The Faema E61 on display at MODA’s Passione Italiana: The Art of Espresso exhibition. In the US, the allure of the cult-status machines—with suitably mystical-sounding names, such as Mirage and Spirit—boomerangs back to their maker, a faraway industrial-design genius with a reported penchant for driving a 1962 Cadillac and a preference not to be photographed. But to the Dutch he is just “Kees from Brabant,” a friendly businessman from the Netherlands province of North Brabant who will likely visit a coffee bar if it bears one of his handcrafted creations or will just as well receive a local wanting a look-see at his headquarters. Officially known as Kees van der Westen Espressonistic Works, his workshop and warehouse are contained in side-by-side industrial units in the small town of Waalre, a 10-minute drive from Eindhoven’s rail station. Vintage Faema pieces and framed archival photos add character to the place. The staff, 25 in total, whistle while they work. But the interior is otherwise nondescript. There is no doubt that the machines are what matter most here, that all creativity and concentration are devoted to perfecting the process of making espresso. Van der Westen said this much in reply to 20 questions inquiring about his career history, the coffee he drinks nowadays, and a completely new machine currently in his head but which he soon expects to be at his, and, eventually, the world’s fingertips. Read more in that interview to find out about the various customizations that the company offers. The Kees van der Westen website also features a fascinating history of the design of its espresso machines since 1984. On display at MODA’s Passione Italiana exhibition is the Triplette edition from the Mirage line of Kees van der Westen espresso machines. The Mirage Triplette by Kees van der Westen on display at MODA’s Passione Italiana exhibit. Detail from the Mirage Triplette by Kees van der Westen on display at MODA. In addition to the espresso machines, the Passione Italiana exhibition features various other coffee-related items on display, such as the famed Italian coffee pots. One of these objects is the Bialetti Moka. From the early 1950s to the present day, Bialetti has manufactured over 200 million coffee makers. If you want to learn more about the Bialetti Moka, check out this post. Mendini’s work in product design was influential in the sense that it pushed the boundaries of what products could be. A notable example is his Lassú chair from 1974, a chair built on top of a pyramid structure, which forgoes conventional notions of function. Mendini was addressing the domestic object as a conduit for spirituality, an idea reinforced by his ritualised burning of the chair, photographed for placement on the cover of Casabella in 1975. Mendini organized the Oggetto Banale (Banal Object) exhibition at the Venice Biennale of Architecture in 1980 and included this espresso maker as an entry. The AnZa introduces new materials to the design of the espresso machine. The model on view at MODA is made of concrete, wood, steel, brass, and glass. The designers raised over $145,000 on Kickstarter to put the machine into production.⁣ You can watch the Kickstarter video here. The AnZa, on display at MODA’s Passione Italiana exhibition. Another view of the AnZa, on display at Passione Italiana exhibition. One of the highlights of MODA’s Passione Italiana exhibition is the limited edition espresso machine by Victoria Arduino. In celebration of their 100th anniversary, the company made 100 of these machines (called the Venus Century) and had them blessed by the pope. Machine number 000 was donated to Pope Benedict XVI, who had declared his passion for espresso. The particular machine seen below was lent to the exhibition by Espresso Southeast out of Auburn, GA. The Victoria Arduino Venus Century is perhaps the centerpiece of the exhibition at MODA’s Passione Italiana. With Passione Italiana, MODA introduces the Co.Lab, an experiential space within a gallery that’s inspired by the spirit of creativity fueled by coffee. The immersive environment is developed by MODA with some of Atlanta’s most creative entities to offer a center for making, thinking, talking, and learning, and will feature expansive communal tables within an inviting shared space. Visitors to Co.Lab will be invited to participate in What is Your Story, a crowd-sourced storytelling installation organized by design firms Orange Sparkle Ball and non-profit sister, Spark Corps, in collaboration with BooknBrunch that provides a touching look at how untold stories, struggles, and secrets can forge connections. The hands-on project will invite guests to anonymously inscribe their story in a used book on view at MODA and give visitors the opportunity to respond to these stories by sending a supportive message via postcard. This is one of the coolest aspects of this exhibition, and I captured a few photos below from guests who participated in What Is Your Story. A display at Co.Lab’s What Is Your Story installation. 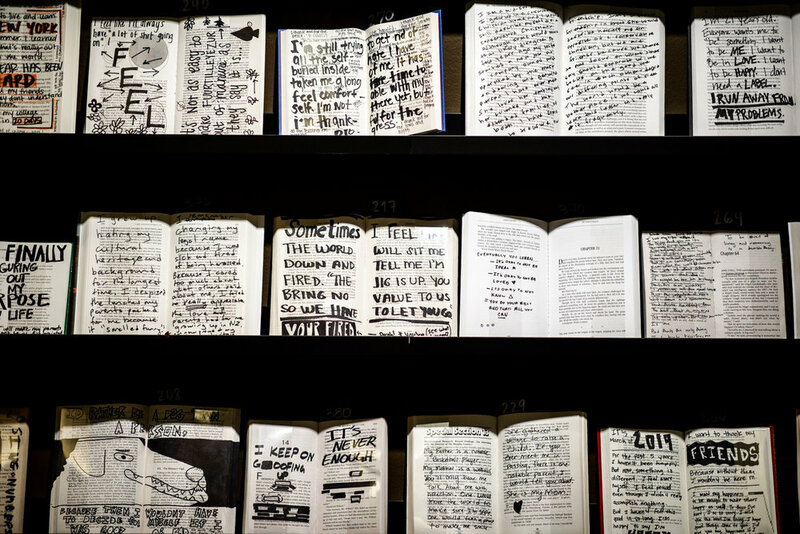 A wider view of books that have been annotated/marked by visitors at Co.Lab’s What Is Your Story installation. You can respond to the questions/prompts by sending a postcard to the author of the story/question/prompt. I reached out to Laura Flusche, Executive Director at MODA with some additional questions about the Passione Italiana exhibition. This Q&A is presented below. Q: What was the process like for putting this exhibit together? Was it something in the works for a long time? LF: We planned this exhibition for about a year. It's a traveling exhibition that originated at the Cube Design Museum in Holland and was curated by an Italian design curator named Elisabetta Pisu who is with the IMF Foundation. We asked the curator if we could adapt the exhibition so that it better reflected MODA's idea of design as a creative process that inspires change, transforms lives, and makes the world a better place. So, we added some machines like the Victoria Arduino Century (the big machine in the back gallery) that we were able to source locally. And we did some research on the ways that coffee has fueled creativity and change across history and included that information. Because we prioritize active participation over passive observation in our exhibitions, we collaborated with Orange Sparkle Ball and Spark Corps to develop the Co-Lab which provides a coffee shop-esque environment and in which visitors are invited to participate in the What's Your Story project. As it appears at MODA, the exhibition was designed by Susan Sanders, who wanted to create an immersive environment that would provide visitors with an experience akin to being in an elegant coffee shop. Q: What's been the response/engagement like for the Co.Lab "What is Your Story"? Have you mailed a lot of postcards? LF: Lots! I don't know the number as Orange Sparkle Ball is tracking that, but I'm sure it's in the hundreds. And even more stories have been written in books. Visitors generate somewhere between 40 and 70 of those each week. Q: Do you have a favorite piece or installation in the current exhibit? LF: Several! I really like the Victoria Arduino Century machine, both for its size and glamour, but also for the fact that we found it right here in Georgia. I'm also a big fan of the Alessi Tea and Coffee Tower projects — especially the ones designed by Massimiliano Fuksas & Doriana Mandrelli and by Dominique Perrault. They're so elegant. Q: What's been the most surprising aspect of the exhibit to you and, based on your views, to the people that visit this exhibition? LF: I think it's the design and technology story that explains how espresso (as we define it today) came into being. Before I started working on this exhibition, I never thought much about the origins of espresso, why it came into being and how design and technological developments over time enabled us to make it. Q: Is there anything else that you want to share about Passione Italiana with an audience of coffee enthusiasts? LF: Even if you don't like coffee, you'll like this exhibition, as the machines are beautifully designed! There is a lot to discover at MODA’s Passione Italiana exhibition. Passione Italiana: The Art of Espresso runs at MODA (address: 1315 Peachtree Street NE, Atlanta, GA 30309; Google Map here) through June 15, 2019. Pro tip: sign up to go on one of the guided tours of the Passione Italiana exhibition (current dates: April 28; May 5; May 9; May 16; May 19). MODA does not have designated parking, but offers a 20% discounted museum admission for patrons who walk, bike, or use public transportation (MARTA) to get here. MODA is located about a five minute walk away from the Arts Center MARTA station. You can check the MODA’s opening hours here. Final verdict: I highly recommend visiting this exhibition if you have any interest at all in design and/or the world of coffee. You’re guaranteed to learn something new and see something beautiful. One of the most interesting and unique coffee shops in the Atlanta area is Docent Coffee, located in the Old Fourth Ward / Sweet Auburn neighborhood of Atlanta. This coffee shop has a unique mission in making coffee and art accessible, without being snobby or pretentious. 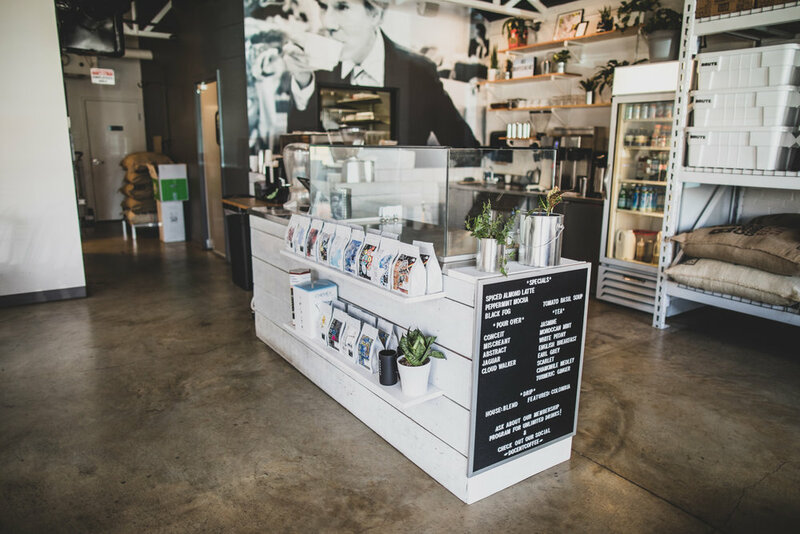 The coffee shop—which also does an incredible job roasting coffee beans in-house—partners with local artists and puts their artwork on every coffee bag they sell in store and online. We think specialty coffee should be more approachable, which is why we have taken it upon ourselves to make great coffee, and the community it has traditionally been associated with fostering, accessible again...to everyone. We at Docent feel that you can roast and serve seriously amazing craft coffee, without taking yourself, and the entire endeavor, too seriously. After all, the hip branding, the carefully curated social media content, and all the other already well-trodden 'coffee cliches' relating to specialty coffee aren't going to make that coffee you're drinking taste any better or worse...so why hang your hat on that stuff? So we just try to be ourselves. This simply involves roasting the best coffee we can, forging personal relationships with coffee farmers from around the world, sourcing the best teas available, seeking out/promoting great local art, and doing our part to support the communities we feel passionate about. Similar to how a docent at a museum is there to guide you, the team at Docent Coffee aims to do so for both coffee and art—they are there to helpfully navigate you in discovering something new in coffee and in art. It’s an amazing concept that is truly unique not just in the city of Atlanta but in the greater United States. I visited Docent Coffee in February and had multiple interactions and discussions with the co-founders. As a result, this blog post is the lengthiest I’ve published to date, but it is because there is so much to cover. Those of you who appreciate both the technical and the artistic/creative will enjoy how the co-founders’ vision meshes together at Docent Coffee. Q&A with the Docent Coffee co-founders, including how Docent Coffee came to be founded and the vision of the co-founders; the Q&A is with Mr. Docent (focusing on art) and with Nolan, focusing on coffee roasting. Docent Coffee is located in the Old Fourth Ward / Sweet Auburn neighborhood of Atlanta at 381 Edgewood Ave SE, Atlanta, GA 30312. The space was previously occupied by Cafe Velo. The coffee shop features ample seating inside, and there is a wonderful patio/courtyard adjacent to the shop that offers plenty of seating as well and is pet-friendly. There is also a covered patio on the second floor, accessible via back stairs. The front of Docent Coffee on Edgewood Avenue. Photo courtesy of Docent Coffee and used with permission. Interior at Docent Coffee looking toward the Edgewood Avenue front entrance. Interior of Docent Coffee. The view through the window is toward the outdoor courtyard (patio) of Docent Coffee. A view of the courtyard at Docent Coffee. 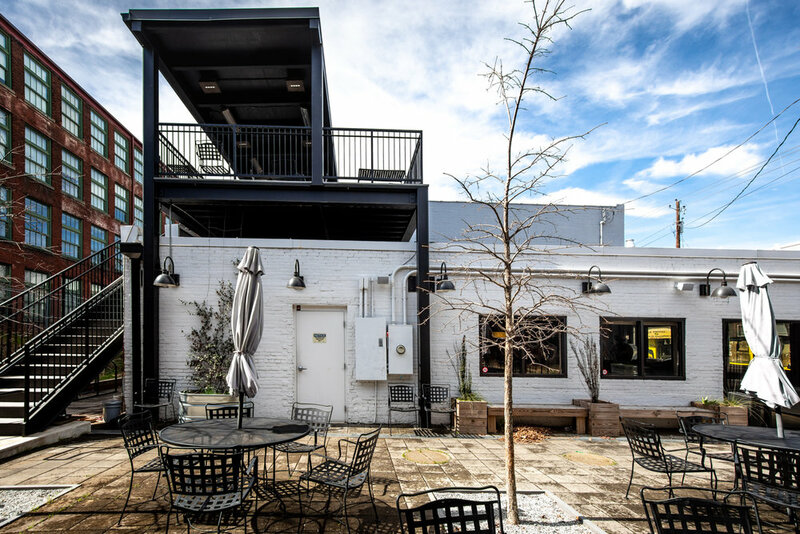 There is plenty of outdoor seating and the space is pet-friendly! Note the stairs on the left leading to the second-floor patio with a covered roof. The patio at Docent Coffee captured during summer. Photo courtesy of Docent Coffee and used with permission. The covered patio on the second floor at Docent Coffee. The interior of Docent Coffee. There is a full espresso bar. Docent Coffee also offers various sandwiches which are all named for famous artists. Interior design of Docent Coffee. The coffees seen on the two shelves are profiled in this section. Interior of Docent Coffee. That is Andy Warhol drinking a cup of coffee seen on the back wall. Interior coffee vibes at Docent Coffee. Another view of the interior of Docent Coffee. Wide-angle view of the interior of Docent Coffee. The coffees on the two rows are profiled in this section. The blue accents work well inside Docent Coffee. The menu at Docent Coffee features pour-over coffee, drip coffee, cold brew, and the classic espresso drinks like a cappuccino or a cortado (see the full list of coffees in this section). There are also loose leaf teas (from Rishi Tea) on the menu. Light snacks/meals include bowls, toasts, and various pastries (such as croissants, cookies, and muffins that are baked fresh daily). The menu at Docent Coffee. Most interestingly, Docent Coffee also has sandwiches on the menu which are all named after famous artists: Warhol, O’Keefe, Banksy, Twombly, Kahlo, de Kooning, and Rothko are currently on the menu. A selection of rotating/season specials (such as the lavender latte and the tomato soup) rounds out the menu (PDF). The following are the coffees that are currently available at Docent Coffee. Because Docent Coffee is both a coffee shop and a roaster, each of the coffees profiled below is roasted in-house (Docent Coffee is closed on Mondays for roasting). Click through the links to go to the individual pages on the Docent Coffee website for additional details. Jaguar is a Costa Rican single origin, honey-processed coffee with notes of pomegranate, roasted almond, and cane sugar; it is a light to medium roast. I have personally tried the Jaguar in my espresso machine at home and highly recommend it. The artist featured for this coffee is Kelly McBride (Etsy | Instagram). Conceit is an Ethiopian single origin, naturally processed coffee with notes of honey, concord grape, blueberry, and pineapple; it is a light roast. The artist featured for this coffee is John Tindel (Web | Instagram). Miscreant is a Zambian single origin, wash-processed coffee with notes of watermelon, apricot, and lime; it is a light roast. This coffee would be excellent for a pour-over. The artist featured for this coffee is Sarah Emerson (Web | Instagram). Cloud Walker is a Papua New Guinean single origin, peaberry-wash processed coffee with notes of chocolate, honey, and fig; it is a light roast. The artist featured for this coffee is Craig Dongoski (Web | Instagram). It’s Classified is a Kenyan single origin, wash-processed coffee with notes of mango, red berry, burnt sugar, and meyer lemon; it is a light to medium roast. This coffee is also excellent for a pour-over. The artist featured for this coffee is Craig Dongoski (Web | Instagram). Snarf Snarf is an Ugandan single origin, wash-processed coffee with notes of red apple, black tea, caramel, and fig; it is a medium roast. The artist featured for this coffee is Amelia Carley (Web | Instagram). Ayahuasca is a Peruvian single origin, wash-processed coffee with notes of chocolate, walnut, and apple; it is a medium roast. The artist featured for this coffee is Kyle Brooks, aka BlackCatTips (Web | Instagram). Cream + Sugar is a Brazilian and Guatemalan blend coffee (natural and wash-processed, respectively) with notes of cocoa, burnt sugar, strawberry, and rose; it is a medium to dark roast. The artist featured for this coffee is Trendz (no link to social media presence as he is private/anonymous). Meander is a triple blend coffee from Tanzania, Peru, and Indonesia (wash-processed from all three origins) with notes of berries, chocolate, and raisin; this coffee blend is a dark roast. This blend is great for both espresso and drip coffee. The artist featured for this coffee is Jeff Demetriou (Web). Inconceivable is an Ugandan and Colombian blend coffee (wash-processed for both origins) with notes of brown sugar, caramel, and dried cherry; this blend is medium to dark roast. (Editor’s note: pay attention to the Inconceivable link; I hope the reference makes sense). The artist featured for this coffee is R. Land (Web | Instagram). Counterfeit is a Colombian single origin decaf coffee with notes of cherry, citrus, and cane sugar; it is a medium roast. The artist featured for this coffee is Miya Outlaw (Web | Instagram). Epiphany is a Colombian single origin wash-processed coffee with notes of chocolate, cherry jam, and plum; it is a medium roast. The artist featured for this coffee is Angie Jerez (Web | Instagram). A selection of coffees at Docent Coffee. From left to right: Cloud Walker, It’s Classified, Miscreant, Abstract, and Snarf Snarf. The coffee bags available for purchase at Docent Coffee. In focus at the far left: Epiphany. A selection of coffees at Docent Coffee. From left to right: Counterfeit, Cream+Sugar, Meander, and Inconceivable. The espresso at Docent Coffee is the Meander: a triple blend of coffee beans from Tanzania, Peru, and Indonesia (in a 40/30/30 ratio by weight). Hailing from the Kilimanjaro, Amazonas, and Sumatra regions, respectively, this dark roast blend allows for an incredible tasting cappuccino, cortado, or other espresso-based drinks that Docent Coffee offers. I had the chance to try the cappuccino, and I was blown away by the quality and taste. For more about why Docent uses a triple blend of beans for its espresso (rather than a single origin coffee), read the Q&A with Nolan below. A video of the cappuccino being prepared by Nolan from Docent Coffee is below, followed by a few photos. The cappuccino from Docent Coffee. The cappuccino from Docent Coffee, next to the Meander triple blend (Tanzania, Peru, Indonesia) coffee bag. Another view of the cappuccino next to the Meander. 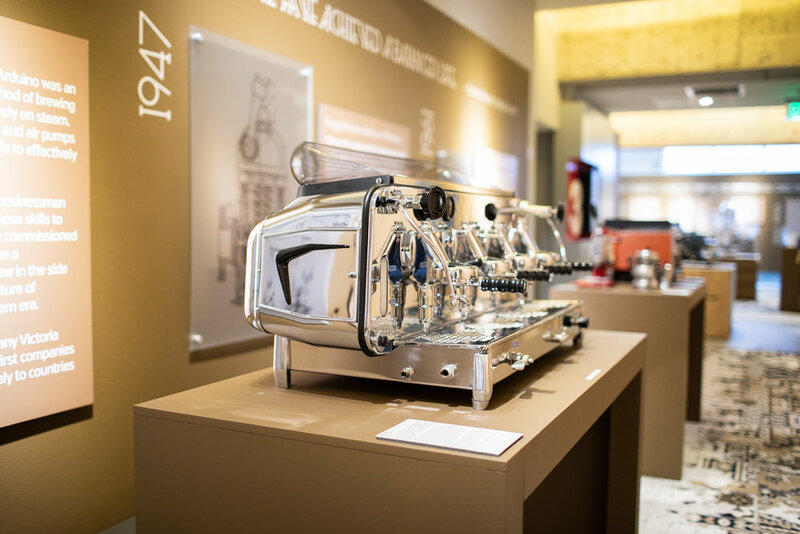 Docent Coffee is currently partnered with the Museum of Design Atlanta which has an ongoing exhibition called Passione Italiana, chronicling the evolution of the espresso machine. This exhibition, which opened on February 24, runs through June 9, 2019. There are some incredible items on display at this exhibit at MODA, including an espresso machine made of concrete! Docent Coffee will work with MODA to bring coffee cupping/tasting events both at MODA and at their coffee shop throughout the months of March and April; check the MODA calendar for details. The joint event with MODA and Docent Coffee that was held on March 9 was at full capacity. Finally, Docent Coffee will soon unveil monthly cuppings and brew classes (tentatively scheduled to begin in April 2019). As spring brings warmer temperatures, there will also be pop-ups and other events hosted on the patio of Docent Coffee. Best way to keep track is to follow the Docent Coffee Instagram account or check the Atlanta Coffee Shops events page. Docent Coffee is closed on Mondays as this is the day of the week when they roast the coffee. I had a chance to visit Docent Coffee on one of their roast days and spoke with Nolan, the master roaster at Docent Coffee, about the roasting operation. 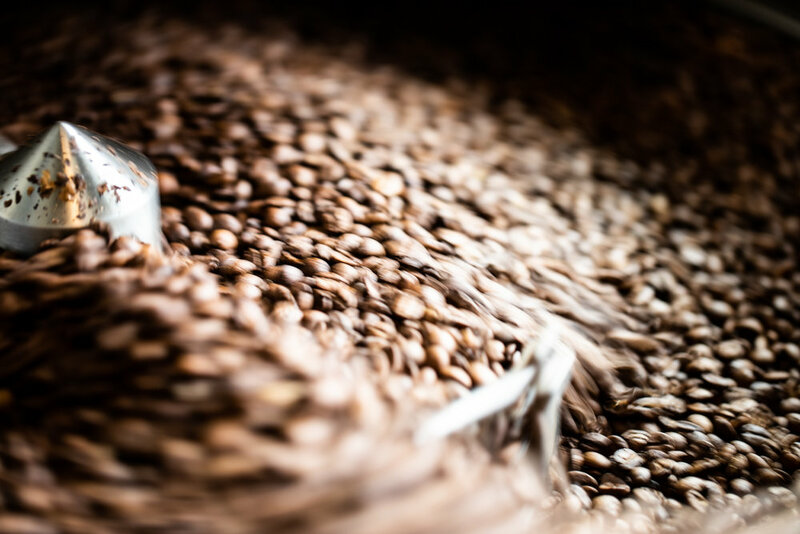 At the heart of the roasting operation at Docent Coffee is a Diedrich Roaster; Nolan has complemented the hardware (the roaster) with an open-source software to precisely monitor the temperature profile of the beans as they are roasted. For those curious, there are a few open-source roasting applications available on GitHub. During my visit, I saw the Cream + Sugar (Brazil and Guatemala) blend and Miscreant (Zambia) being roasted. For the coffee blends, Nolan uses a simple 50/50 split by weight to combine the beans after roasting. During my extensive conversation with Nolan, I was really impressed with Nolan’s technical background (he has a mechanical degree from Georgia Tech) and his passion for roasting coffee. On the (very?) nerdy side, as we discussed the technical details of coffee roasting (the science aspect of roasting compared to the art aspect of roasting), topics such as concavity and differential equations came up in our conversation. I was thrilled to have this conversation because, as someone with a technical background as well, I could relate to what Nolan was discussing. As you read through the Q&A with Nolan about his experience, you’ll learn how Nolan built his own coffee roaster during his time at Georgia Tech and how his experience has ultimately shaped him to become the master roaster at Docent Coffee. A few photos from the coffee roasting day at Docent Coffee are below. Nolan getting ready to put some coffee beans sourced from Brazil into the hopper for roasting. First batch of coffee beans is roasted! Nolan getting ready to start roasting the Guatemalan coffee beans. Freshly roasted! The coffee roasting software is seen running on the laptop in the background. Freshly roasted! Look at that smoke! Macro detail of the freshly roasted beans. Detail from the beans getting cooled. Final step before mixing the beans and packaging—collecting the cooled beans. Q: Can you tell me more about how Docent Coffee came to be founded and how you two met each other? Did you have any connections to the owners/team at Cafe Velo as you transitioned into their space? Docent Coffee: We met each other through a mutual friend (who was also in coffee) after we both expressed an interest into putting together a different kind of coffee roasting business and shop. We each brought different things to the table, and those different things happen to mesh very nicely to form a very cohesive and solid brand/concept. Nolan’s focus would be all things coffee, while mine was more in the branding, creative, and outreach departments. We often use the Apple analogy of Nolan being the Steve Wozniak component of Docent and myself being the Steve Jobs component. Aside from providing Cafe + Velo with their coffee the last several months they were open, we did not have a connection with them. Q: In my conversation with Nolan, one highlight was that the staff that used to work at Cafe Velo is still employed at Docent Coffee. Can you comment more on this detail? Docent Coffee: Yes. Initially the most of the original staff came onboard with us; however, a couple of our employees moved out of state a couple of months after we opened, so now we have one remaining Velo employee. Q: What are your favorite coffee drinks? Docent Coffee: Black coffee is our number 1 of course, but I think it’s safe to assume cortados and cappuccinos would be our 'espresso-based drink’ favorites. Q: Can you talk more about your membership plan for coffee? It sounds like a really great deal. What was the impetus for this decision and was this something you've wanted to do from the start? Docent Coffee: It is a really great deal if you’re even an average coffee drinker. We just figured it would be a better way to get more people engaged with better coffee at a fraction of the price they would pay elsewhere piece-meal. Q: Do you have any events that you are hosting on a regular or semi-regular basis? If so, what are they? If not, do you have any plans? Docent Coffee: We plan on offering monthly cuppings and home brew classes very soon. Probably starting in April. March—April we will be doing this type of programming with MODA and their current Passione Italiane espresso design show (both at MODA and at Docent). Lots of pop-ups on the patio are in the pipeline as well. Q: What have been some of your biggest challenges in running Docent since opening up your coffee shop? Docent Coffee: Probably the biggest is just getting out there enough so that people know you exist, and where you are. After that hurdle is overcome, you’ve got to get them to taste the coffee. When you have a coffee scene so dominated by convenience and style, it can be difficult for carefully crafted premium coffees like our own to get the recognition and reception we feel they deserve. Q: Can you briefly talk about your experience with art and how you envisioned incorporating coffee and art into a coffee shop? Who are your favorite artists/inspirations? Do you follow any art blogs? Mr. Docent: I’ve been a career artist for over 20 years, and I noticed very similar parallels with regard to how both art and specialty coffee are perceived, presented, and approached by the general public. In my opinion, they both suffer from the same 'perception problem’ and/or cliches often associated with the two that prevent a large majority of the population from even considering in learning more and/or having deeper experiences of the two. Quite simply, the pretense, and the air of exclusivity surrounding both, creates an unnecessary ‘barrier-to-entry’ for a lot of people; something that an analogous industry like, say, craft beer doesn’t have. We are both very passionate about coffee and art, so I thought Docent would be the perfect vehicle to utilize in bringing what we felt are enjoyable and expansive experiences to more people in more places…without the pretense. Q: Do you have a strategy for finding local artists whose work goes on the coffee bags? Is it personal connections you've made over the years, strolling through Instagram looking for inspiration, or something else? Mr. Docent: I have a strong network of local artists I know to whom I initially reached out to be involved, but we also receive submissions as well. It’s combination of our own discoveries, submissions, and suggestions that all get filtered through a curatorial process. Q: Is it correct that the only non-local (Atlanta-based) artist featured on your coffee bags is a South-Carolina based artist Kelly McBride with the Jaguar design? Mr. Docent: Yes. Given that we felt the subject matter for that coffee/bag needed to be more literal, we sought out artists we felt would work well for the label. Mr. Docent: My favorite artists are Cy Twombly, Marcel Duchamp, Robert Motherwell, Robert Rauschenberg, Mark Rothko, and Janet Echelman. Q: Is there anything else that you'd like to share about the art + coffee theme that others reading this Q&A would appreciate? Mr. Docent: We encourage people to check out more different kinds of art and our more different kinds of coffee. Getting more engaged in either community is very rewarding and eye-opening. You don’t need to ‘know anything about art (or coffee)’ to appreciate or like it. Picasso once remarked that he didn’t need to understand a sunrise for it to move him. In my opinion, this view captures the essence of appreciation for really anything. At its core, it’s the visceral experience of person that’s the most pure, powerful, and honest one. It’s when you start passing it through the filter of your mind and unrelated qualifications that you can convince yourself its something entirely different. Q: We spoke about your coffee experience during your days at Georgia Tech, how you came up with your own coffee roaster, which led to some seed money to begin TopTime Coffee. Did you foresee yourself going in the direction where you currently are (co-owner / head roaster) compared to the degree you received? Was there a moment where you knew for certain that one day you'd open up a coffee shop of your own? Nolan: I definitely didn't see myself roasting coffee when I started school. Like many of my friends at Tech, I thought I would end up with an engineering job at a lab somewhere. As I got further into my education, I realized my love of building machines. During my second year, I received some grant money to invent a product that would solve a problem, so I 'solved' the problem of home coffee roasting by building a prototype roaster. I turned this project into a year of research about the coffee roasting process to improve my designs. This project sparked a fascination with the coffee industry, building roasters, and eventually led me to start Docent with Mr. Docent. Q: TopTime Coffee, your coffee start-up/cart at Georgia Tech, is going to open a second location soon. How passionate is the coffee community at Georgia Tech? Do you foresee expanding to other parts of Georgia Tech or perhaps to other universities? Nolan: From four years of personal experience and now running two shops on campus, I can say with certainty that those students live on coffee. The coffee community at Tech is fairly large and well-versed, so I've always been surprised at the lack of good, accessible coffee to students/faculty. One of my goals when I graduated was to open a shop on campus so I could solve that problem, and we are now opening our second one a year after the first. Editor’s note: TopTime Coffee launched its second location in the Van Leer Electrical & Computer Engineering Building on March 4, 2019. Q: I think we are in agreement that the coffee roasting process can be both an art and a science. Can you comment on how your engineering degree has informed your views on the technical/science part of it? Nolan: Absolutely—and for me more of a science than an art (but don't tell Mr. Docent!!). Studying heat transfer and thermodynamics in school really helped open my eyes about potential problems with roasters on the market and how changing your roasting parameters can alter the chemistry inside the beans dramatically. I think that with any craft such as this, the person in control should fundamentally understand every process which takes place and why it occurs. Of course there is also an art in creating a beautiful temperature curve and cupping a delicious end result—I'm just better at speaking nerd language. Q: For the coffee aficionados of the world, you mentioned that coffee beans used in espresso should not be single origin but a blend. Can you elaborate more on your stance? Nolan: Some roasters will hate me for this, but I believe that espresso should always be a blend. In my experience with single origin espresso, I find that the flavor profile tends to be too one-dimensional. If a coffee has a bright, fruity profile, I don't want that to be the only thing I can taste. To me, espresso should tell a story. I blend three different coffees in our espresso that offer a wide variety of flavors. When dialed in correctly, the shot should come in three phases: floral, chocolate, and berry. I am the type of person that can't appreciate a good steak without a side of potatoes and green beans. I don't think espresso should be treated any differently. Q: Is there anything else that you'd like to share with a wider audience about coffee, favorite coffee shops, your interests, etc.? Nolan: I think naturally processed coffees are underrated and deserve a chance. I love coffee from the Democratic Republic of Congo, Uganda, and Guatemala (Ethiopians and Kenyans are great too but those already get too much love). My favorite coffee shops are ones that I make friends at. My girlfriend and I foster pit bulls from Fulton County Animal Shelter. We have adopted two of them so far. Docent Coffee has an amazing concept and vision. The coffee is some of the best I’ve tasted in Atlanta. The partnerships that Docent Coffee has forged with artists are wonderful; Docent Coffee embodies how a local business can and does support other locals in creative fields. If you haven’t already, put Docent Coffee on your must-visit itinerary for a one-of-a-kind experience. If you like what you see (and taste), you can become a patron of Docent Coffee for $50/month for unlimited espresso coffee drinks and teas (there is also a yearly patron option if you’re seriously committed). In my opinion, Docent Coffee in Atlanta is a coffee shop that deserves much more awareness and recognition than it has garnered so far—I hope you visit, taste the coffee (and view or talk about art), and hopefully agree with this assessment. Docent Coffee: helping you discover something new about coffee and art, without pretense. In the wise words of Steve Jobs: that’s who they are—that’s what they are about. I can’t wait to see what the future holds in store for Docent Coffee, and I hope you do too.